Looks at the making of the Oxford English dictionary. Here, as so consistently throughout, Winchester finds exactly the right tool to frame the scene. "One in a hundred people today suffer from schizophrenia: Nearly all of them, if treated with compassion and good chemistry, can have some kind of dignified life, of a kind that was denied, for much of his time, to Doctor Minor. Except, of course, that Minor had his dictionary work. And there is a cruel irony in this—that if he had been so treated, he might never have felt impelled to work on it as he did. By offering him mood-altering sedatives, as they would have done in Edwardian times, or treating him as today with such antipsychotic drugs as quetiapine or risperidone, many of his symptoms of madness might have gone away—but he might well have felt disinclined or unable to perform his work for Doctor Murray. In a sense doing all those dictionary slips was his medication; in a way they became his therapy. The routine of his quiet and cellbound intellectual stimulus, month upon month, year upon year, appears to have provided him with at least a measure of release from his paranoia. [...] One must feel a sense of strange gratitude, then, that his treatment was never good enough to divert him from his work. The agonies that he must have suffered in those terrible asylum nights have granted us all a benefit, for all time. He was mad, and for that, we have reason to be glad." There's a fascinating story here, but it's a little over-told for the sake of adding drama and pathos to the history of the OED; it's a compelling enough tale without the 'omg, and THEN guess what' that the author tries -needlessly - to inject into the writing. Winchester's real strength is delivering history and biography in an accessible manner, having a keen sense for important detail and rich seems of interest; where he lets the reader down is in assuming we will not realise these things for ourselves, but must be pointed at them repeatedly. One of the most productive relationships in the history of modern dictionary making began with a murder. On February 17, 1872, William Chester Minor, an ex-patriated Civil war surgeon, in a schizophrenic rage, gunned down George Merritt in London’s Lambeth slum. He was tried, found not guilty by reason of insanity, and sent to Broadmoor Asylum. It was there that he found a measure of mental solace in a most unusual endeavor. Simon Winchester’s The Professor and the Madman details what happened next. In the late 19th century, there was a push to create a wondrous new reference book: a complete historical dictionary of the English language. It would use written works as its basis for both spelling and usage. This “New English Dictionary” was a gargantuan task. After a few fits and starts with different editors, James Murray became the project’s caretaker and secured the Oxford University Press as its publisher in 1878. He put out a call to readers and amateur word sleuths across the country to send in interesting, different, and obscure usages of words and their sources. In just four years’ time, he had 3.5 million quotation slips. Minor, sitting alone at Broadmoor, came upon the public appeal through the booksellers he regularly ordered from and began to catalog everything he could find. He kept a dutiful organization system, sending in thousands of quotations over the course of his life. Minor and Murray met in person only once, and there are no notes from that day, but the work each did for the preservation of language cannot be dismissed. With Minor’s help (and the help of many others), the dictionary was issued in full in 1928. Simon Winchester is not a linear writer. Instead, he likes to weave back and forth from the main story to different background stories that do end up coming back to the main story...eventually. What I found fascinating was the background story of two men that were geniuses that come from opposite backgrounds and end up having a twenty year friendship. At times I felt bogged down and this is not a book to be read in a week end. "I am nobody, treat me as a solar myth, or an echo, or an irrational quantity, or ignore me altogether". Throughout the book, it is clear we can not ignore a man like James Murray. He left school at the age of fourteen, became self taught through numerous books, tried to teach Latin to cows, he was fluent in several languages including many dead languages, he taught himself geology, biology, entomology, and because of his love for words among being a very learned man, was instrumental in creating the greatest dictionary of our time. William Chester Minor was also a genius but was also insane. Throughout the book, we get to see a background of his life growing up, what he saw as a doctor in the Civil War during a battle called "The Wilderness". Perhaps this is what threw him over the edge into insanity, although I would guess that it was a perfect storm of circumstances throughout his life that drove him over the edge into insanity, perhaps it was in his mind all along. What I found fascinating about this book was the history of the dictionaries before the OED. I have learned so many things in this book of 242 pages that seemed more like an 800 page book. The Irish who fought in the Civil War (I have a new appreciation for the Irish and a better understanding of why so many deserted), Sri Lanka, the history of the dictionary, lexicography, branding in the civil war...the list goes on and on. Fascinating story, but a bit wandering, and the author's tendency to freely make stuff up (like the theory that the subject had an affair with his victim's wife, which even the author admits is based on zero evidence) left a bad taste in my mouth. In 1858, a group of Oxford lexicographers under the direction of Dr. James Murray conceived the daunting task of compiling the comprehensive collection of the English language. The task culminated seventy years later when it was published in a twelve-volume set. Since this undertaking required the perusal of existing English literature, how a word developed over time, and examples of its use, hundreds of volunteers were needed. As is the case in many charitable efforts, volunteers came and went. However, one individual, Dr. William Minor, an American army surgeon, was so fascinated with the project that he stuck with it for 20+ years. Little was known about the man that contributed so much that Dr. Murray decided to meet him at his current address at Broadmoor Hospital, an asylum for the criminally insane in northern England. Assuming that he was a staff physician, he was surprised to learn that the individual who had been so helpful over the years, had been incarcerated there after murdering a man when Dr. Minor was in a paranoid and delusional state. I had read "The Meaning of Everything", Simon Winchester's recount of the history of the Oxford English Dictionary, and so I was inevitably drawn to "The Surgeon of Crowthorne". Winchester is a very good writer and makes a story that is essentially about a bloke who spends a long period in a mental hospital interesting. Of course, no matter how intersting the read is, what stays in your memory for some time afterwards is the (spoiler alert) surgeon's self-emasculation. It was, to say the least, an eye watering moment for me. This is an amusing account of the creation of the Oxford English Dictionary, a mental marvel enjoyed by millions. Now, since the OED is online, the massive book is gaining many new fans. The particular episode described here is also an illustration that a form of mental illness is no great bar to some forms of scholarship. The story was quite surprising. The writing of the story seemed extremely redundant. Listening to it alternated between frustration at the redundancy and fascination with the actual meticulous compilation of the grand masterpiece. I think it may have caught my attention because Simon Winchester both wrote and narrated it. But of course, I didn't really mean to be attracted to Simon Winchester but Simon Vance, one of the best narrators I have come across! It was a very good book to "listen" to--for an American who reads many British books--to hear the actual pronunciation of words not commonly used in American English. What is the likelihood of any one particular person winning the lottery? Or of being struck by lightning? These are just two well-known instances of something that could possibly happen but seem so rare and unlikely that they could never have been predicated. And so also is the tale told by Simon Winchester in The Professor and the Madman (Harper Perennial, 2005). Winchester takes the story of two very different men, an American physician, Dr. W.C. Minor, and an English lexicologist, Dr. John Murray, and shows how their lives became interwoven through the writing of the Oxford English dictionary, the most comprehensive effort ever made to define the words that make up the English language. Murray spent nearly a lifetime developing the dictionary and Minor was a prolific volunteer contributor to it, sending in thousands of suggestions. Winchester tells the separate parts of their early lives, the intersection of what, in its own way, became their life’s work, and the development of their friendship, something that didn’t occur until nearly twenty years of their working together, albeit separated by Minor’s confinement to what would be called a mental health facility today. Minor’s hospitalization was something that Murray was unaware of for many years, and that is just one of many surprising twists that true life took in the lives of these men. One of my graduate school friends possessed what is known as the condensed or compact version of the OED, which is essentially the OED in miniature typeset. The condensed version text is so tiny that the OED comes with its own magnifying glass. An official attached-by-a-chain magnifying glass. At $350 for the condensed OED, I wondered how my friend managed to scrape together the money to buy one. Of course we all had student loans, part-time restaurant work, and Ramen Noodles in the cupboards. Turned out he found it at a garage sale. He paid $50 for all but one volume. I think ph-po was missing from the set. I couldn’t believe it. The OED––for 50 bucks. I was jealous. Intensely so. Not of his tee-shirts, which looked like they came from the same garage sale, but of his good fortune. Throughout graduate school, I dreamed he’d grow tired of possessing it and out of the goodness of his heart, bestow it to me. Never happened. Ever since, I’ve wanted to own the OED. I even went so far as to price the full volume, full-sized set. When the Barnes & Noble employee gave me the price over the phone, she gasped and declared that a decimal place must have been off (it wasn’t). Yes, it is the price of 2400 packages of Ramen Noodles. In addition to the issue of an exorbitant price tag for the full volume set, there was (and is) the issue of storage space. Thirty hardbound volumes would have required not only another bookcase in my apartment, but also another wall space in the apartment that didn’t (and still doesn’t) exist. 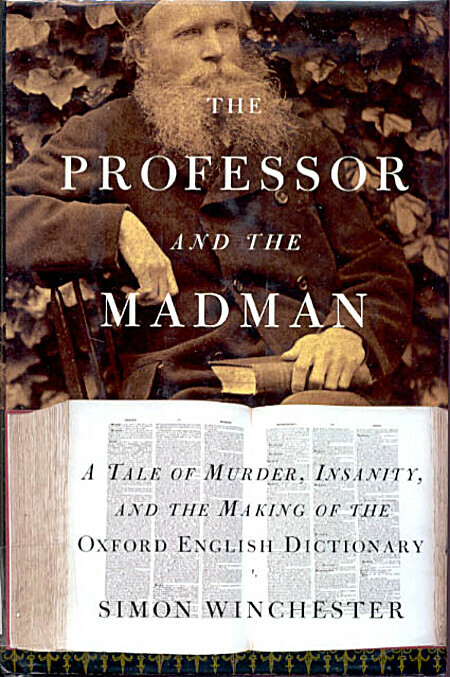 "The Professor and the Madman, masterfully researched and eloquently written, is an extraordinary tale of madness, genius, and the incredible obsessions of two remarkable men that led to the making of the Oxford English Dictionary––and literary history. The compilation of the OED, begun in 1857, was one of the most ambitious projects ever undertaken. As definitions were collected, the overseeing committee, led by Professor James Murray, discovered that one man, Dr. W.C. Minor, had submitted more than ten thousand." One man submitted more than ten thousand definitions to the dictionary. Imagine ten thousand dictionary definitions. Imagine ten thousand of anything. If writing a ten thousand word prose piece is an achievement, then what is writing ten thousand––more than ten thousand––dictionary definitions? That’s some serious serious etymologizing. I was astounded. When I read the next sentence in the back cover blurb, “When the committee insisted on honoring him, a shocking truth came to light: Dr. Minor, an American Civil War veteran, was also an inmate at an asylum for the criminally insane,” I was hooked. Of course I bought it. Bookstore managers clap their hands with joy when they see a customer like me walk through the door. At $13.00 plus tax, I figured even if I couldn’t purchase The Book, I could at least own a book about its history. And for any bibliophile, the book is a delightful read, full of anecdotes and facts such as, “the total length of type [for the first edition]––all hand-set. . .is 178 miles, the distance between London and the outskirts of Manchester,” which roughly corresponds to the distance between Bloomington-Normal and St.Louis. Winchester’s book also includes excerpts of Murray and Minor’s letters and quotes from the 19th century tabloids (about the murder, the murderer, the ‘call for words’). Readers also learn bhang, brick-tea, brinjal, catamaran, cholera, delicately, directly, dirt, disquiet, drink, duty, and dye were among Dr. W.C. Minor’s favorite words. It was then I became certain that someday I must figure out a way to purchase that OED. Perhaps eat 2400 packages of. . . and 2000 cans of . . . I could perhaps swing an egg for breakfast. . . In the midst of all those calculations (and I’m still calculating), I discovered a few years ago that Milner Library had subscribed to the online version of the OED. That treasure trove of histories and meanings of even the most obscure of words (such as frisson) was available to me––for the best price around: $0.00! Reading the format––digitalized text streaming through fiber optic cables and readable through a GUI––is different than perusing the onionskin pages of a leather bound book. And I can’t cart my Mac around the apartment, never mind out to the mailbox nor to the convenience store around the corner, but the purpose is the same: an etymological encounter. The book was recommended to me by a bookseller, one of a rare breed today who actually reads and enjoys the books on the shelves and does not merely sell them. I always value the opinion of someone who lives for books. There are two main characters in the book. One was wealthy, one poor, one Yale educated and one self educated. Yet they collaborated on the Oxford English Dictionary without knowing their backgrounds were so diverse and their mental states so different. It was a “marriage” of the minds of two men, James Murray and William Minor who were polar opposites. One was locked away from the world in a lunatic asylum and one preferred to be locked away from the world of publicity, maintaining a low public profile as much as possible. One achieved infamy and one success. James Murray was a self-educated lover of learning and literature who worked his way up the ranks of the literary world to become the editor of the Oxford English Dictionary in 1879. How these two men work together to pursue the same objective is the theme of this brief little book of unusual historic significance. Because of the call for volunteers to study books and word lists to create a pool of words to examine and from which to choose to include in the final dictionary, the unlikely relationship was born. Some time, in the early 1880’s, Minor became aware of the call for volunteers to work on the dictionary and he offered his services. He was highly qualified and well educated, though delusional as well, but this fact did not become known to Murray for several years and did not influence him to stop the relationship between Minor and the production of the dictionary. Actually, after a visit to the asylum, by Murray, a friendship developed. At times the book is dry and tedious but the historic impact of the project was and still is today, monumental. How sad that the Oxford English Dictionary will no longer be published in hard cover. It is a piece of history being allowed to wither and die with the advent of technology. In many ways, this is a great read simply because it's an entertaining book full of strange and interesting tidbits of knowledge. The problem is just as clear, though--there are so many interesting stories and directions which the book is pulled in, that in the end, none of them are given the depth a reader really wants. Whether you're most interested in the creation of the OED or the friendship between the two men at the heart of the book's title, or even trivia surrounding both, the book explores so much territory, and is so short, that I doubt any reader will be fully satisfied. Still, it is a fun and fast read with plenty of interesting trivia, if not the depth or full story that the book's title and blurb seem to promise. One would not expect a history of the Oxford English Dictionary to be particularly interesting, but indeed, there is quite a story behind it. A tremendous amount of the dictionary's research was done by a convicted murderer mired in severe mental illness. This book recounts the strange tale of how W.C. Minor came to write significant portions of the dictionary and, more broadly, how the OED came to be. this is the kind of story that you would never believe is true if it weren't written by such a master as Simon Winchester. A great read. The pretext for this book is rather slight – one of the significant volunteer contributors to the Oxford English Dictionary was, although an intelligent and educated man, also an inmate of an insane asylum, confined for a murder committed while in the throes of a schizophrenic paranoid delusion. While, as a revelation, this fact may be less than earth-shattering, Winchester uses this story of the inmate, Dr. W.C. Minor, the man he killed, George Merrett, and the main editor of the OED, Dr. James Murray, as a vehicle for all kinds of interesting details – he goes on quite a number of tangents, but they're always immensely well-written and fascinating! Winchester isn't afraid to stray from dry, historical writing – he definitely makes guesses, fleshes things out for colorful effect – but his research is also obviously thoroughly done, and he also stops short of fictifying (ok, that's not a word, but I think it should be) his topic – it's always made clear when his scenarios are theoretical. This book was excellently written. It kept me interested from the beginning to the end. I had no idea how recently the Oxford English Dictionary came into being. We read today and if there is a word we do not understand, we pick up the dictionary to look it up. It was interesting to know that Shakespeare did not have this luxury. The characters in the book evolve nicely. The book left me wondering what the life of W.C. Minor was really like. How is it that he contributed so much to the Oxford English Dictionary from an insane asylum. I was left wondering what the emotions must have been as Sir James Murray realized that he was dealing with a madman in the creation of the dictionary, yet W.C. Minor's submissions to the dictionary were near perfection. Other volunteers that contributed were not as precise. This book will entertain you in the history of how the Oxford English Dictionary was created. Who was involved? How long did it really take? What methods did they use to document all those words? Does it continue today? It was a fascinating read! A great story, and of particular interest to anyone who loves the English language!